Halloween, as the ultimate children's holiday, may evoke your own childhood memories of that magical day and evening. Or it may have a darker side as children fill your yard, just for this one evening, with joyful anticipation. What's so dark about that? Well, for one, they're not your children, even though they may stimulate your fantasies about how much fun it would be to create imaginative costumes for your own little one(s), usher a child through the neighborhood on that night, and sort through the goody bag once all the treats have been collected. So what is this holiday like for those who yearn for parenthood? To many of us it serves as a reminder of the cheers that children echo again and again in the weeks before Halloween as they shop for or create their own costumes, visit pumpkin patches, carve the pumpkins and stock up on sweets. There's lots to cheer about if you're listening to the kids, but I often found myself feeling emotionally sidelined as other parents shepherded their little ones through the anticipatory preparations. Then when Halloween actually arrived I could put on a happy face at my front door, but at the end of the night I knew it had been just that - a happy face covering the wistful emotions in my heart. And inevitably there would be some tears shed. Sometimes they were an over-reaction to smashed pumpkins or T.P. 'd trees the next morning. More often, though, my tears were in response to the feeling of not being in The Club, to which I devote an entire chapter in my book When You're Not Expecting. This feeling of being left out of parenthood, of being deprived of cuddling a child each day, of missing the opportunity to re-live aspects of my own childhood if only I could share them with my child...these were the precipitants to my misty eyes as Halloween approached, peaked, and life moved forward again. And, of course, as I came to learn and dread over the years of my infertility, Halloween was just the beginning of a long series of family holidays (more of this in future blogs). So each year I would view Halloween as a testing ground to prepare me for how I would try to reconcile my infertility with others' celebrations of holidays that often had children, pregnant relatives, nursing mothers and infants in attendance. Having begun this blog with some reference to "cheers," I will end it by sharing a personal "cheer." After three years of battlng infertility, my daughter was born in late October, and we arrived home from the hospital the morning of Halloween. With no time to carve pumpkins and barely enough sense to purchase some candy bars, we welcomed trick-or-treaters with genuine joy and enthusiasm. Many of the neighborhood kids had been curiously observing my swelling abdomen, so they considered themselves very privileged to get a first introduction to "the newest kid on the block" that evening. My husband and I had decided to dress her in the most symbolic of costumes: a Red Sox hat and bib. To us, as loyal Red Sox fans who met during the World Series season many years earlier, who had cheered the Red Sox on for countless years without a World Series victory, we knew what it was like to hold out hope eternally. We had held out hope for our child's birth for what felt like an eternity, never knowing we would have the joy of a baby to cuddle on this special children's celebratory holiday. Sympathetic as your girlfriend may have been to your infertility struggles, now that she is pregnant you know your relationship is facing some unanticipated twists and turns. What are some of the issues you'll both need to discuss? What hopes and fears do you share? How can you keep your communication with each other as open as possible? As I mentioned in my blog last week, both of you will need to recognize the imbalance you are facing, as she is potentially experiencing joy and ambivalence and you are likely feeling envy, envy and more envy. So, let's look at the envy issue head on. It is there and both of you know it. But how you handle it can make all the difference. And it will probably be up to you to broach this subject. You might begin by saying to your friend that you are feeling both happiness and envy as she anticipates the upcoming months of her pregnancy. You may say that you worry about feeling left behind as her life becomes increasingly preoccupied with plans for the baby's birth. And you will want to reach out to her to affirm that this is a friendship you treasure and to ask if both of you can spend some time now anticipating how you can keep the relationship resilient. Hopefully she will be relieved that you have taken the lead in opening this conversation. And hopefully she will ask for your ideas on how to remain close friends as her pregnancy progresses and as she becomes a parent. So here are the things you'll need to think about as you and she pursue this conversation. What do you think will cause you emotional pain? Conversations that focus on the pregnancy? Seeing changes in her living arrangements as some space is set aside and furnished for the nursery? Seeing your friend with a distended abdomen? Wondering whether she cares to hear about your continuing saga of infertility treatment? Feeling that you are the logical one to give her a baby shower and recoiling at the thought? Recoiling at the thought of even attending her baby shower? Anticipating that she might ask you to be her child's godmother? Knowing that you would be devastated to visit her in the maternity wing of the hospital after the baby's birth? Wondering about how both of you will have time to invest in your friendship after the baby is born? Those questions and possibly others suggest that you will need to look within yourself to anticipate the experiences you can handle, those you want to avoid, and those you don't even want to hear about. And, of course, when the reality presents itself you may feel differently than you had anticipated, so you and she may need to leave some room for re-discussing some of these issues as time moves forward. But the glue that will hold this friendship together rests with both of you being willing to bring up potentially painful issues and ask each other how you can handle them so both of you feel supported. You both may need to accept that the changing face of the friendship may include sharing discussion on some topics but not on others. It may include more telephone conversations, more texting and less face-to-face time during certain periods, It can include an awareness that your friend is reaching out to others for support and shared happiness when she knows certain areas are just too painful for you. And this leads to another issue for you. As you find that certain areas of conversations and contact with your girfriend are diminishing, you may decide to fill that potential loneliness, at least temporarily, with other activities or relationships. 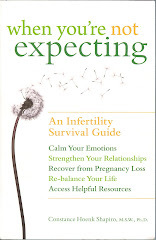 As I discuss in my recent book When You're Not Expecting, this time when friends and loved ones are pregnant or young parents often propels individuals with infertility to develop relationships with acquaintances who are empty nesters, who are child free, who are infertile, or whose children are away at school or otherwise not a time consuming presence in their lives. In addition to a shift to new relationships, you also might choose to get more involved in activities, social causes, political concerns or community issues that capture your interest or passion. Doing this can offer new relationships, distract you from being overly preoccupied with infertility, and make you a more conversational partner for new and familiar acquaintances. So this blog is not about how envy may poison a treasured friendship. It is about how relationships evolve over time, how even envy can co-exist with mutual thoughtfulness, how your own insight about a friend's pregnancy and young motherhood can guide you in the way you raise with her your hopes and fears, how your friendship may change but need not deteriorate, and how you can continue to nurture a treasured ongoing friendship at the same time you reach out for new relationships. Resilience is the key here, as both of you seek a new balance in your changing lives.